The Renogy Solar Panel Starter Kit 400W includes 4pc 100W Solar Panel, 30amp Charge Controller, sixteen Z Brackets, Branch Connector, and one 20ft MC4 Adaptor Kit. With the ability to run off 12 volts, Renogy 100 w solar panels can be used in multi purpose applications including RV, marine, boat, and home installations. You can maximize the efficiency of your solar project with Renogy custom built 100 Watts solar panels, 4 included in this 400 watts solar kit. Renogy Monocrystalline Solar Panels will give you the most power for your roof square footage and the ability to withstand extreme elements and severe weather including low level light conditions. These solar panels are capable of withstanding heavy snow and strong wind loads. These solar panels have waterproof IP67 rated MC4 type solar connectors. 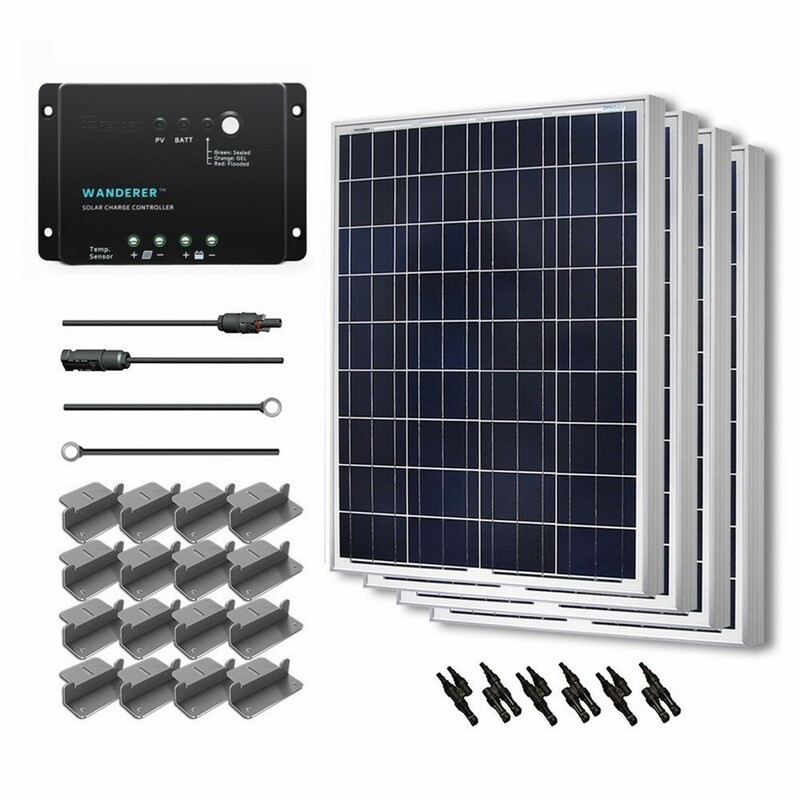 Renogy is a registered trademark of RNG Group Inc.
$588.99, The Renogy Solar Panel Starter Kit 400W includes 4pc 100W Solar Panel, 30amp Charge Controller, sixteen Z Brackets, Branch Connector, and one 20ft MC4 Adaptor Kit. With the ability to run off 12 volts, Renogy 100 w solar panels can be used in multi purpose applications including RV, marine, boat, and home installations. You can maximize the efficiency of your solar project with Renogy custom built 100 Watts solar panels, 4 included in this 400 watts solar kit. Renogy Monocrystalline Solar Panels will give you the most power for your roof square footage and the ability to withstand extreme elements and severe weather including low level light conditions. These solar panels are capable of withstanding heavy snow and strong wind loads. These solar panels have waterproof IP67 rated MC4 type solar connectors. Renogy is a registered trademark of RNG Group Inc.About RenogyRenogy started as a small project by students at Louisiana State University. With the help and support of the Louisiana Business and Technology Center, Renogy has grown into a healthy and flourishing company. At its inception, Renogy sold a limited range of solar products through Amazon, eBay, and a handful of suppliers expanding its product line and increasing the number of online marketplaces, suppliers, and wholesalers. Over the years, Renogy has received numerous awards and recognition, including an award for Graduate of the Year from Louisiana Business and Technology Center in 2014, a spot on Inc. 5000's top 500 fastest growing private companies, and being certified by the Women's Business Enterprise National Council. Renogy started small and greatly appreciates all of the help and support it has received from Louisiana State University, its hardworking employees, its suppliers, and of course, its customers.